You can become a donor right now. Donate in your own name or in the name or precious memory of someone else. 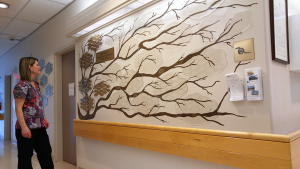 With the approval of the donor, the Foundation acknowledges the generosity of those who have given through donor appreciation boards located in the Chemainus Health Care Centre. At the Reception Desk at the Chemainus Health Care Centre. Please leave your donation with the receptionist who will issue a tax receipt as appropriate. An In memoriam donation is an extremely important source of funds for the Foundation. Please consider this as a way of supporting the community while honouring the memory of someone special. Other important ways to support a healthy community include, naming the Foundation as a beneficiary in a life insurance policy, transferring qualifying securities, and bequests given through a Will. Bequests are common option chosen by many and are a valued source of funds for the Foundation. Community Health: Funds are distributed to all categories, as required. Chemainus Health Care Centre (CHCC):Funds are spent only on the Health Care Centre. This includes Residential Care, Palliative Care, Urgent Care and Adult Day Care. Please specify. Steeples:Funds are spent only on Steeples assisted living. Donations over $10.00 are eligible for a tax receipt. To receive a tax receipt, all donations must be made payable to: Chemainus Health Care Foundation. We are a registered charity. Click here to confirm our status with Canada Revenue Agency.